Growing up, breakfast was usually cereal, Eggo waffles, or whatever we normally ate (what exactly did we eat mom?). Nothing too crazy. On weekends when we could convince my dad, he would make stacks of fluffy American pancakes. But when my mom made pancakes? She only ever made Swedish ones. Sometimes for breakfast, sometimes for breakfast-for-dinner. Call it a win-win, having both an American and a Swedish parent: 2 kinds of pancakes always. 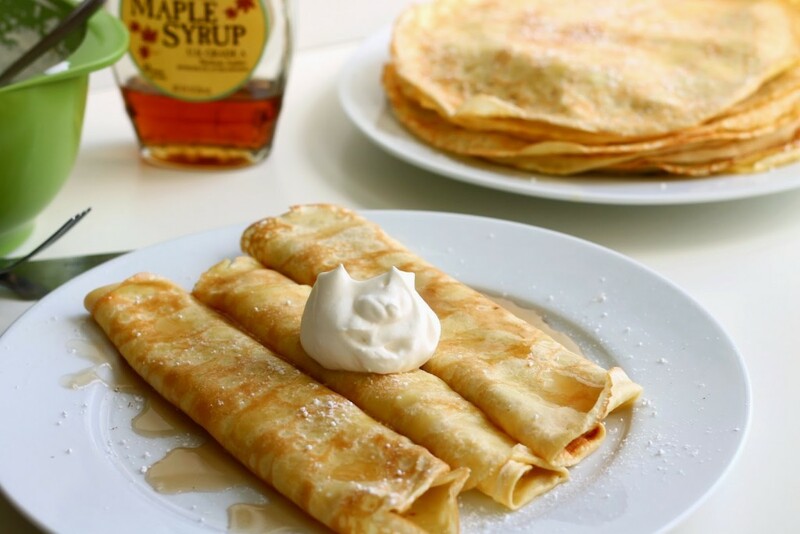 I thought it was appropriate to post about Swedish pancakes while I’m currently in Sweden, eating plenty of freshly baked bullar, drinking so much delicious Swedish coffee and espresso, and soaking up all the Swedish-ness I can until I can manage to make it back out here for another visit. Ideally, that would be in August. If only.. Anyway, pancakes. If you’re looking for crazy thick, fluffy, stacks of pancakes, these aren’t those. Instead, these are thin and light. 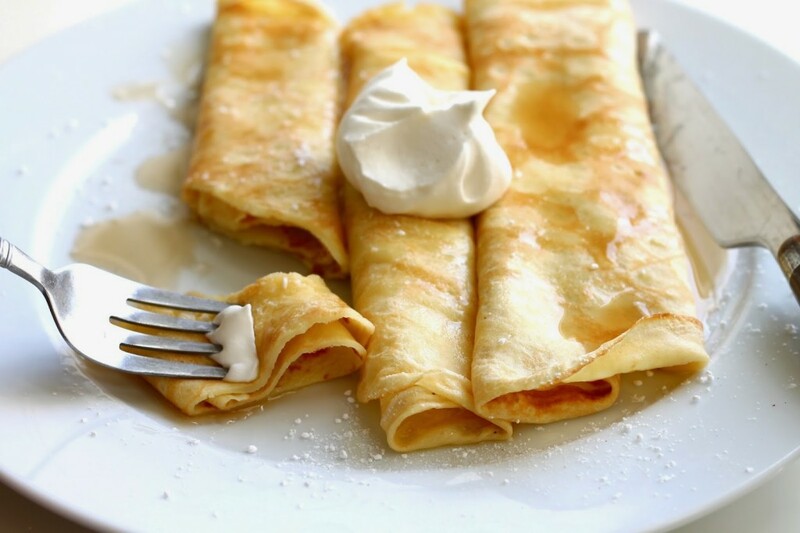 They’re almost like French crepes but they’re not. You can stack them, but they’re better rolled up or folded, filled and topped with whatever you’re in the mood for. They’re best served hot/warm, but I honestly ate the leftovers cold when I was sitting at the airport waiting for my flight to Sweden and they were still delicious. As you can see, I got crafty and made a collage (yay!) to try and show the process of making these. Trying to take pictures while making pancakes that cook really quickly is definitely a challenge. They’re really not that difficult, but I just wanted to show what I mean below in the directions. The top left, you pour in some of the batter. Easy. Top right, swirl the batter around the pan so it coats the whole bottom. Easy. Bottom left. You know it’s time to flip with the batter looks set like that. I was actually holding the pan on it’s side for that picture, and as you can see, the batter wasn’t running and didn’t move. Flip it over and then you’ll get the bottom right picture! It might take a few tries to get the hang of it, but it’s really quite easy. If you’re looking for a special way to celebrate the weekend, try a hand at these pancakes. They look a lot more difficult than they are to make, and I’m sure everyone will bow down at your feet. 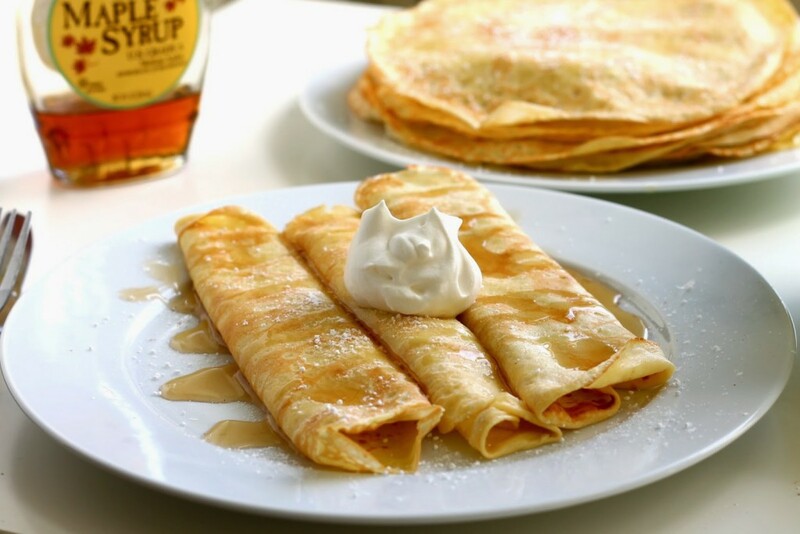 They are great served with freshly whipped cream, powdered sugar, syrup, and/or whatever jam you might like! If you want to get crazy, add some Nutella or you can take these a savory route. Experiment with toppings because like regular American pancakes, you really can’t go wrong. In a large mixing bowl, whisk together flour, sugar, and salt. In a separate bowl, whisk together eggs, milk, water, and butter until well blended. Pour wet ingredients into the dry, mixing until well combined. Heat a large nonstick pan over medium heat. Add a sliver of butter, coating the pan. Pour a scant 1/3 cup of batter into the pan, quickly swirling it around so that the batter covers the bottom of the pan evenly. Return to heat and let cook for 1-2 minutes, or until the uncooked top of the pancake is no longer runny and the pancake is set. 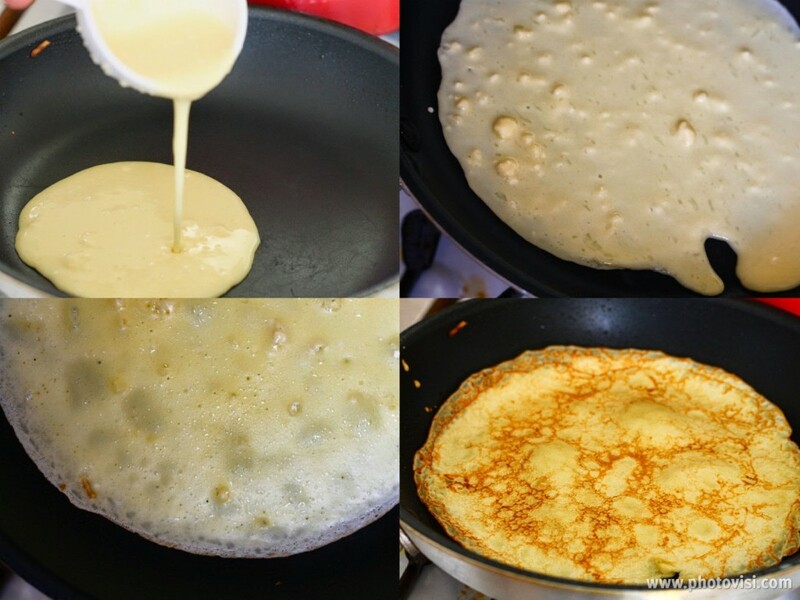 Gently flip the pancake with a spatula, cook for 30 seconds – 1 minute more and remove from the pan. Repeat with remaining batter. You can keep the pancakes warm in a 200 degree F oven. Serve the fresh whipped cream, syrup, butter, jam, and whatever else you might want on your Swedish pancakes! Notes: Using the 1/3 cup measuring cup to portion out batter, I got about 18 pancakes. 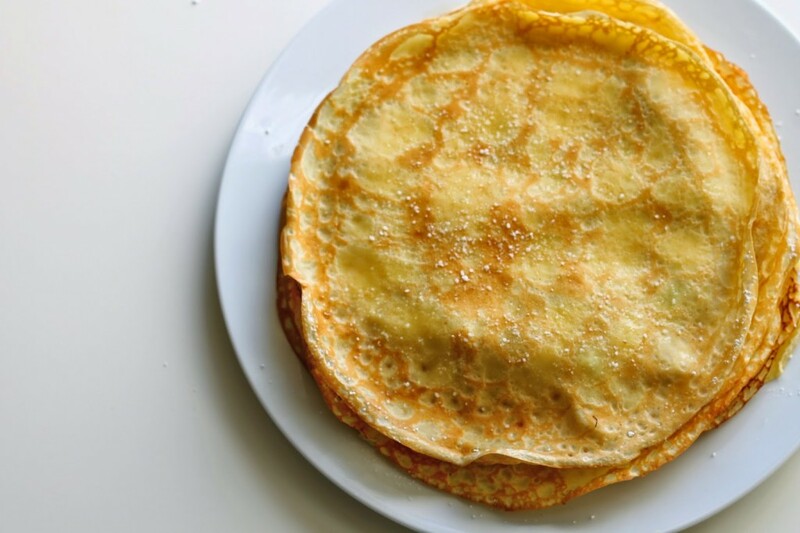 It depends on the size of your pan though – you want the pancakes to be thin, almost like crepes, so if you’re using a small non stick pan, you won’t use a full 1/3 cup.